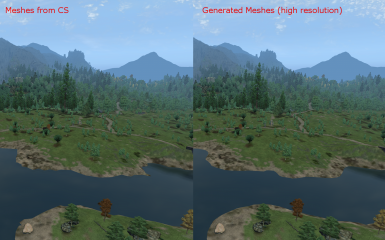 This tool converts the landscape heightmap of all your mods into landscape LOD meshes. It can be configured by a script and adapted to different requirements. * imageresampler, a C++ class for separable filtering 2D image resampling by Rich Geldreich. * crunch/crnlib, for dds file generation. 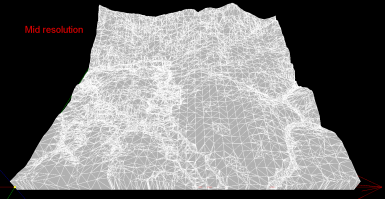 Improved the speed of the vertex placement by a factor of 5-10. 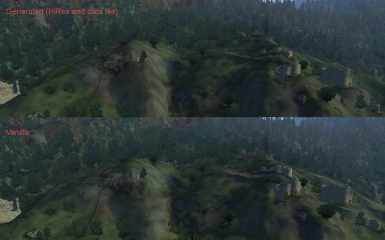 Added a remover for hidden triangles. Added option for the data files. 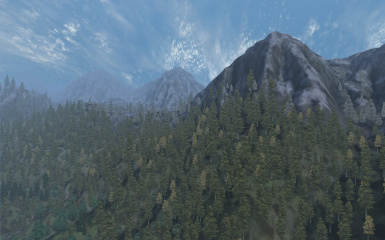 Tes4ll creates new and individual high-resolution landscape meshes including all the additional changes added by the mods which one has installed. In addition to that, it has an expert modus where a script allows to configure the behavior of vertex setting and calculation completely, up to the placement of single vertices. If you interested, read the full manual. 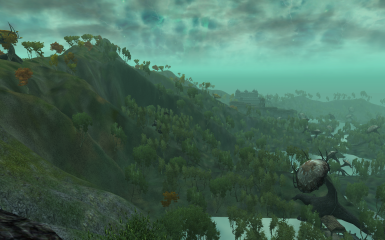 To generate the LODs, tes4ll triangulates the entire worldspace in one single step. The single quads are created and written based on this complete triangulation. This avoids ugly "steps" in the far landscape. tes4ll uses an irregular mesh pattern, whereas the edges of the triangles from the CS are oriented in multiples of 45 degrees. Single vertex points can be self-defined to avoid gaps, floating trees, etc., wherever you want. The number of vertices per quad can be chosen. 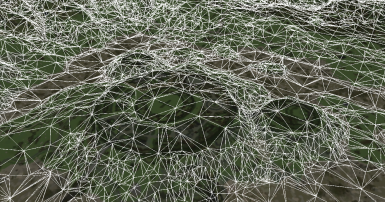 Depending on the system, a larger or lower number of vertices can be defined. 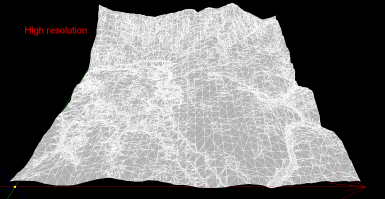 For debugging and better visibility nif files with textures and ps files can be produced. Tes4ll can also produce the normal maps with faked terrain shadows and the meshes for the Immersive Interiors Landscape AddOn (or similar projects). Unpack the tes4ll 7z-archive and move the content into the data directory of Oblivion. When asked, merge the ini-directory of tes4ll into your ini. Start one of the Windows-bat-files by double clicking on it. If you use MPGUI, you also can go into <Oblivion>\Data\ini\tes4ll and double-click on tes4ll_all.mpb. Here you have a hell of options. Use tes4ll_normalmaps.bat, if you don't have MPGUI. You can run the build-in TES4qLOD with MPGUI (recommended) or by using the bat-file tes4_tes4qlod.bat. 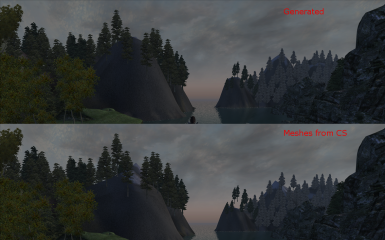 The tool is compatible with TES4LODGen (which replaces only the static meshes) as well as tes4qlod. 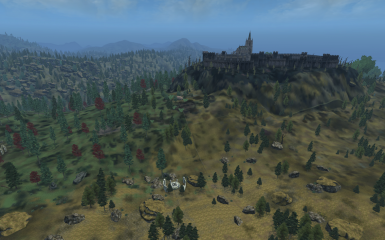 By definition, tes4ll is compatible with all mods which change landscapes. 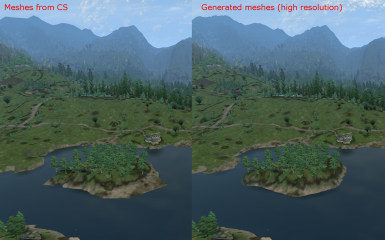 The meshes created with tes4ll are not (yet) compatible with the new LLOD system of OBGE. They come in several versions and combinations for Tamriel. For other worldspaces only one version is provided (ultimate). Installation: drop the archive in <Oblivion>Data or use the nexus manager. imageresampler, a C++ class for separable filtering 2D image resampling by Rich Geldreich. crunch/crnlib, for dds file generation. Lightwave for TES4qLOD and tesannwyn. Auryga, Supierce and llde for testing the program. My wife for all the support (in particular with chocolate and coffee) over the last months and helping me me writing down the vertex data files. ...contain a lot of mods and changes due to my personal Oblivion installation (in particular all UL parts, Kvatch rebuild, Better cities, and many other things...). These changes are not part of tes4ll, which changes only the LOD meshes, nothing else. The software comes under the GNU license and is available via Github. It would be nice to give acknowledgment if you use tes4ll for a mod.